Does the door to your home woodworking shop look like this? Many, if not most, home woodshops are banished to the garage. There the floor is usually concrete, it is often cold, and, worst of all, the area is intermittently shared with a car, lawnmower, and the accumulated junk of modern life. Is this a good place for your beloved tools and woodworking? Of course, there may simply be very limited options – a garage shop or no shop. Maybe other awkward or uninviting places such as a hallway (been there) or the basement dungeon (been there too) will have to do. 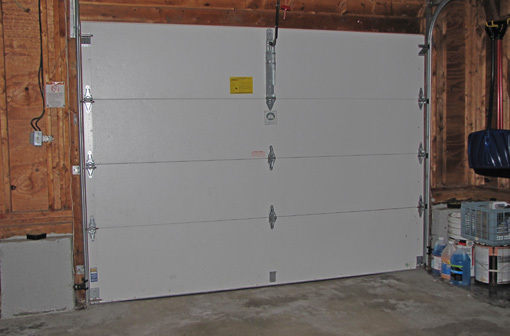 In fact, maybe the garage or basement can be improved to become more comfortable and pleasant. However, at least consider using a room in the house for your woodshop – yes, a real room. For at least the workbench and hand tools, a small room will do just fine. The machines and most of the wood storage could stay in the garage, maybe with some help from the attic or even a closet. Isn’t the TV, excuse me, the home entertainment system, a higher priority? And what about the rest of the family? I don’t know, you’ve got to work that out for your situation. The point here is this: if woodworking is important to you, consider using important space for it. Many people devote considerable space, time, and money to passive entertainment, with which I feel our society is too preoccupied. Many people seem to seek an almost continuous stream of it. I have nothing against entertainment, but it is the balance that I question. There is likely more fulfillment and joy in free hours devoted to creativity – wood, word, music, etc. – than in a video game. We make our choices. I suggest considering what is valuable to you and have your living space reflect that, within the bounds of practicality, life’s compromises, and the needs of those near and dear to you. Good luck and happy woodworking. I have my shop in the third stall of a 3-car garage. It is walled off from the cars and other clutter, it is insulated, has heat and lots of lights. With the heater in the winter and a dehumidifier in the summer, the conditions stay fairly steady. I would love to double or triple the space, but it’s just not an option at this point. I guess my point is that I don’t see any reason to move to a room in the house. The dust and noise are better isolated given the current setup. This is especially important given that I have young kids in the house. If finances and local building codes ever allow it, I might consider building a dedicated shop at some point. Sounds like a great shop! Really we’re on the same page. With insulation, heat, lighting and separation, I’d say that you’ve, in effect, made a room out of part of your garage. Whatever we call it, the main thing is that you’ve dedicated a significant area to your woodworking based on its importance to you. Enjoy it, and thanks for reading. So true, the place where you (wish to) spend most of your time deserves to be comfortable. My shop is one of our 3 bedrooms in our city appartment, with a nice view from the 3rd floor. I use no power tool (except sometimes a drill and a little lathe), so I can work late at night, make little noise and almost no dust. I can watch movies and listen to music while working (and answer the phone…) and my wife is glad I’m “here”. Pure joy. And the best thing is, the quality of my work and my pleasure improved a lot since I dropped power. Sounds like a little bit of heaven on earth, Jerome. Enjoy! I’ve a small finished room in my row home basement. It’s a walk-out, so I’ve two full size windows and a large sliding door. The nature light is lovely. Smallness of the room and the closeness of my neighbors means I’m all hand tools. I guess all that to say you’re right, Rob. It’s important to have a comfortable and pleasant place to work. Rob, after starting out in a 3 bay garage in CA, then back home to Ohio with a heated walkout basement, then to Tennessee back in the garage, I built the shop that you are aware of. 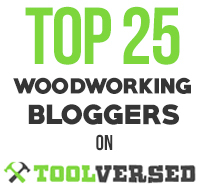 I couldn’t agree with you more, that “if woodworking is important to you, consider using important space for it”, but I also realize that it not everyone has the resources to do so. It took me 20 years to get to the point I could build the stand alone shop, and when it dropped down in the teens, which is pretty uncommon for this part of the state, I was thankful I had a shop with a 68 degree temp set on the heater. 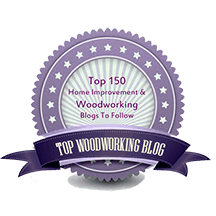 Readers, click on Rick’s name directly above, or the link in the “Woodworking Links” page, and take a look at his enviable nifty shop.